Many architects and designers take the opportunity of working in their own homes to experiment with untested ideas. Certainly, Chris O’Malley of Product X Architecture did when he redesigned the kitchen, dining and living room of his family’s 1975 house. He admits he and his colleague of 19 years Mervyn Hunter were experimenting with the centrepiece of the room: a striking cedar and black metal fireplace wall that bisects the split-level room, which took “a crazy amount of time and 17 sheets of technical drawings”, he says. Chris and his wife Lara, and kids Mason,14, and Stella,12, were prepared to camp through the renovation to bring the stylish gabled house up to date. 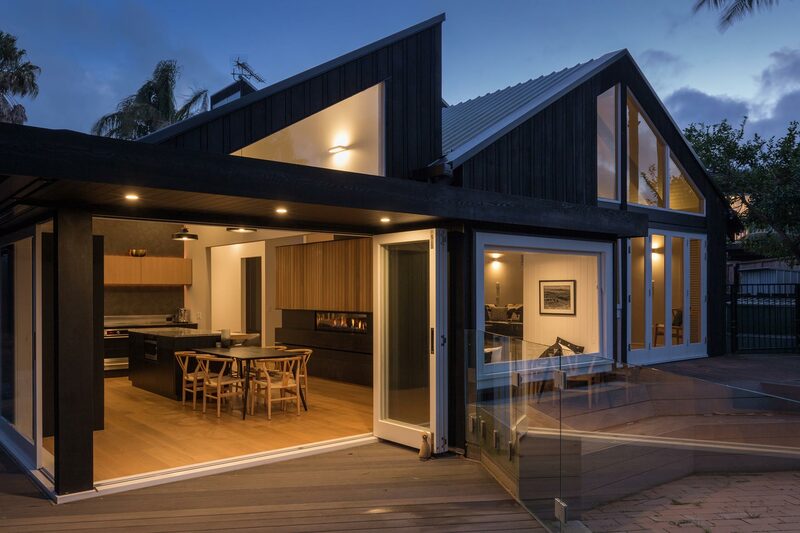 Chris was determined to honour the original architect M J Darby’s clever use of high gabled rooves and clerestory windows that activate the spaces with light. He punched in more skylights to brighten hallways, the dining/kitchen space and master suite. Heavy beams were lightened with white paint with more insulation added above tongue and groove ceilings. But the most dramatic alteration was to open up the wall between the kitchen and living room. 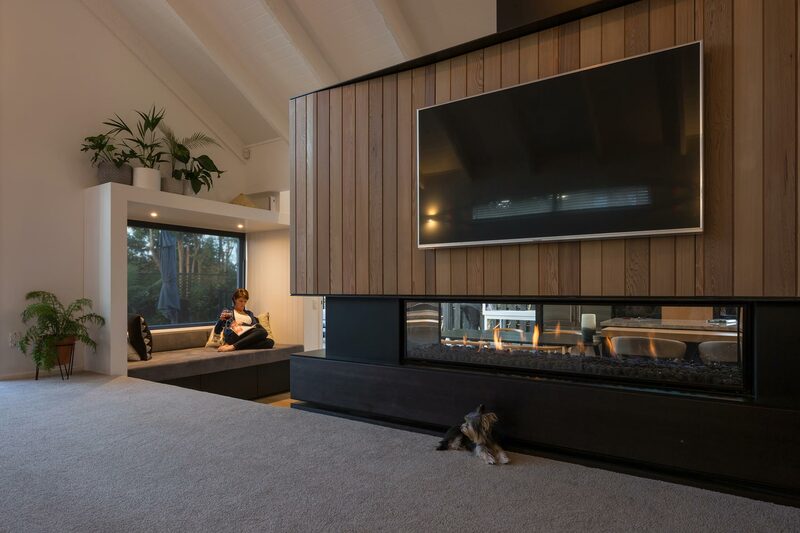 An 8m steel beam took care of the structural issues, but the fireplace divider between the two zones needed to work hard. Because the living room sits three steps above the dining room, the fireplace and entertainment unit between the two needed careful detailing. 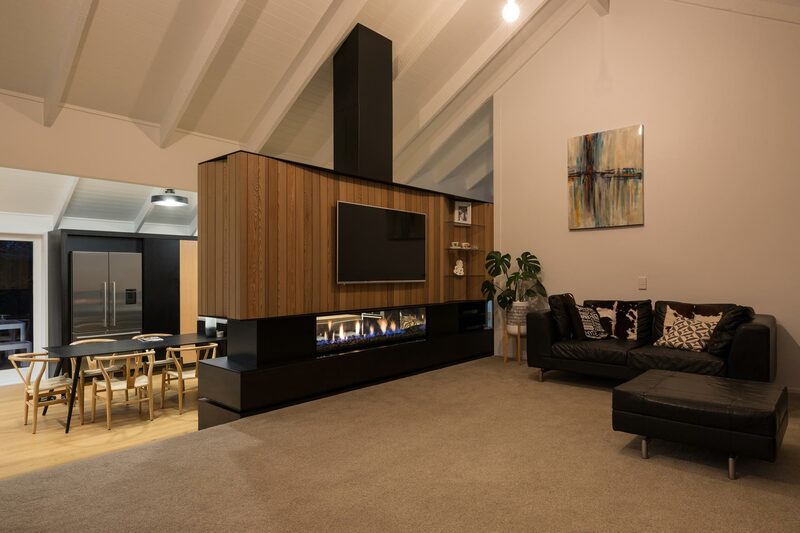 Rather than venting the gas Escea DX1500 multiroom gas fire through ceiling or underfloor to the rest of the house, Chris wanted the warm air to circulate at foot level in the sitting room while warming the backs of diners in the lower room, anchored by deep base drawers on the lower level and a proper chimney breast to highlight the height of the cathedral ceiling. He used a palette of lightly waxed natural cedar, black aluminium (which has the visual heft of steel, without the weight or tricky engineering) and dark stained cedar base. Sleek floor-level vents run the length of the unit, giving it a floating effect, while the timber upper angles in and out to catch the light (and hide storage for the drinks cabinet and electronics). 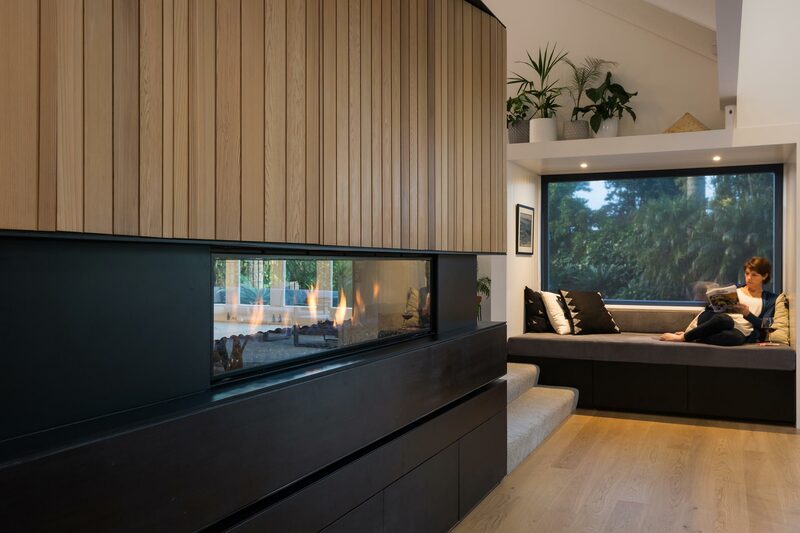 The glass-sided fire allows light and views to be shared between rooms. Chris carried on the custom details in the kitchen, mixing dark oak cabinetry with more of the black aluminium trim and wrapping the new pantry and fridge recess with a frame of lighter oak. Benches are a mix of warm coloured Turkish Tundra stone and 8mm plate stainless steel, while a feature wall of charcoal tiles (with angles to exactly match those of the roof line) anchors the kitchen. Lighting is a mix of eye-catching pendants over the island and colour-changing bands of LED hidden under cabinets (the remote has to be hidden from the teens, who favour a disco-crazy ambience over their parents’ more subtle choices). The finished room and its outdoor components are a fitting tribute to the best of the 1970s-meets-21st century. Chris pulled in a team of experts to create the new system for the Escea fire including gas fitting Excel Plumbing and Gas, cabinet making by Concept Interiors, metalwork by Displaymakers and carpentry by Technical Manoeuvres. Cedar from JSC; timber floors Jacobsens; tile NZ Tile Imports; stone bench, Island Stone (Tauranga); stainless steel bench, Stainless Plus. Chris’s team at Product X Architecture included Mervyn Hunter, Lena Ochkalova, Nina Elsner and Vlad Proskurin; structural engineer, Chris W. Howell and Associates and builders Eagle and Franich. Design Freedom Series: Why is Zero Clearance important to me?